To start the Play with Java, follow the below steps. Step 1: The currently available Play version is 2.4.2. To work with this version, make sure that the JAVA_HOME environment variable is set to JDK8 or more. Step 2: Download the Typesafe’s Activator(Tool from Typesafe which will allow the developers to create Play project quickly. It is built on top of SBT). The Activator will be available in two formats. One is minimum downloadable artifact online version and the other one is offline fully downloadable version(suitable for developers with no internet connection). In this tutorial, we are going to use the minimum online version. Step 3: Extract the downloaded Activator zip file and add it to the PATH environment variable. Step 4: Now, from the command prompt use the below command to create Play for Java application. There are other options available for the activator. To know that, execute activator help command. First time when you run the activator, it will download all the dependencies from the central repository and will take some time to start the Play application. 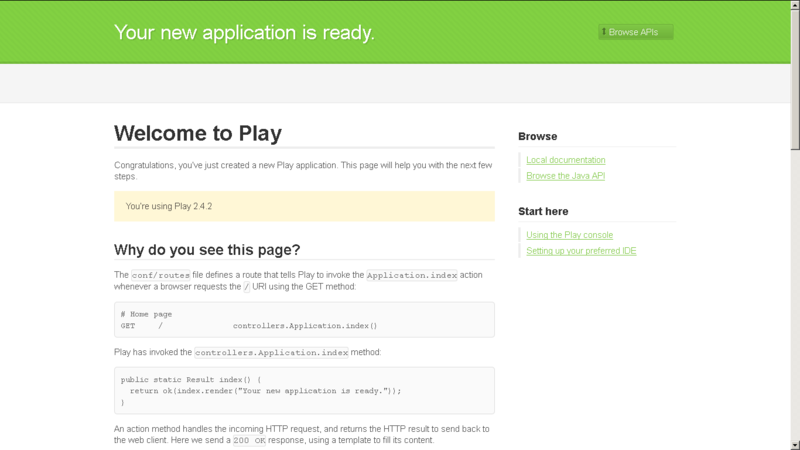 After the application is started on default port 9000, open the browser and send the request to http://localhost:9999 to see the default Play UI as shown below. You are done with your first Play Application creation. In the next article, we will try to understand the Play folder structure and exporting it as our favorite IDE project(Like Eclipse, IntelliJ, etc.). Good information and introduction on Play. Want to see more articles on the same.